Special Olympics Iowa will host the 22nd annual Drake Unified Sports Day Thurs., May 5 at Drake University from 9:30 a.m. to 1:15 p.m. Dedicated to promoting social inclusion through shared sports training and competition, Unified Sports joins people with and without intellectual disabilities on the same team. More than 600 special education and regular education students from 18 schools across Central Iowa will pair up for a day of friendly competition. Partners will participate in 3-on-3 basketball, bocce, golf, pass-punt-kick football, relay races, volleyball and more. More than 125 volunteers, including representatives from Clipped Wings, Laborer’s Local #177 Retirees, Wells Fargo and Drake University football players, will help coordinate the events. Special Olympics Unified Sports promotes social inclusion through shared sport training and competition experiences for individuals with and without intellectual disabilities. Unified Sports has proven to be highly effective in achieving social inclusion. Athletes feel a sense of belonging; they can meaningfully interact with others, develop mutually rewarding relationships, are recognized as contributors and are received with acceptance and respect. 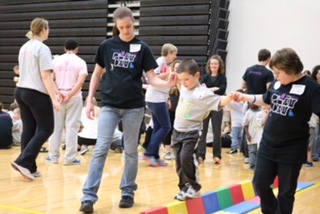 WHEN: May 5 from 9:30 a.m. to 1:15 p.m.
Special Olympics Iowa (SOIA) hosted two Young Athlete Play Activity Day sessions sponsored by Sammons Financial Group on April 21. The event was held at Ankeny Centennial High School with one session running in the morning and one in the afternoon.